Day 1: Fly to Cochin. Day 2 Cochin: Arrive and transfer to your hotel in Cochin. The remainder of the day is yours to explore this vibrant port city which remains a living homage to its varied colonial past. Day 3 Cochin: Morning sightseeing includes the Dutch Palace which dates back to 1568, the magnificently decorated Jewish Synagogue and the Church of St Francis, the oldest church built by Europeans in India. You will also see the famous Chinese fishing nets which are distinctly unique to Cochin. Afternoon at leisure. Day 4 Cochin/Munnar: Morning drive to Munnar, a famous hill station in the south which was the favoured summer resort of the British during colonial days (approx 79 miles/4 hours drive). Set at an altitude of 6,000 feet Munnar is home to rolling mountain scenery, craggy peaks, green forests, picture-book towns and sprawling tea, coffee and cardamom plantations as well as the endangered Nilgiri Thar (Ibex). Day 5 Munnar/Periyar: Morning departure by road to Periyar through the tranquil countryside and thick jungles of the panoramic western Ghat hills. The scenic landscape also includes spice plantations along with the occasional view of small waterfalls and streams. (approx 52 miles/3½ hours drive). During the afternoon set off on what is sure to be an enjoyable nature walk. Day 6 Periyar/Alleppey: Drive to the cruise jetty (approx 93 miles/4 hours drive). At midday you will depart on a traditional rice houseboat or "Kettuvallam" for a fascinating cruise through the narrow and serene backwaters. Enjoy the scenery and glimpses of rustic life as you glide along the palm-fringed narrow canals that wind through the paddy fields and neat hamlets. Stop en route at a riverside stall to see the freshly caught seafood and choose your dinner which the chef will prepare as the sun sets over the backwaters. Alternatively, spend an extra night in Kumarakom at the Coconut Lagoon on bed & breakfast instead of one night aboard the houseboat at no extra cost. 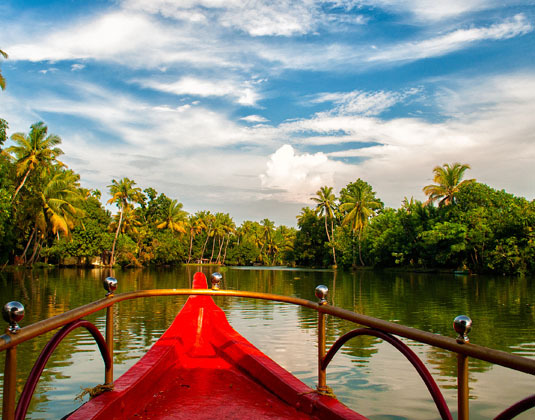 Day 7 Alleppey/Kumarakom: Morning disembarkation and transfer to your hotel for an afternoon at leisure to simply stroll and enjoy the waterscapes. Day 8 Kumarakom/Cochin: Morning drive to Cochin airport (approx 34 miles/1½ hours drive) for your onward journey. Alternatively, consider a three night stay at the charming Marari Beach Resort near Alleppey. What better way to conclude your tour of Southern India than by retreating to the Marari Beach Resort. This is a hidden gem far removed from the outside world, with no televisions and a real eco-friendly focus. You'll still find modern facilities such as a spa, swimming pool, tennis and bicycles along with superb restaurants and thatched villas. Meals: Breakfast. Lunch is also included on day 6, dinner is also includes on days 4 & 6. Tour price: The price shown is based on the best value travel dates in low season and includes international flights, private transfers, entrance fees, services of an English speaking guide during sightseeing (driver only for transfers between cities), sightseeing as outlined and accommodation.